Despite some recent headwinds for the solar PV market, the outlook for renewables in the U.S. is bullish – and that optimism is bringing in new market entrants. CohnReznick LLP and Wood Mackenzie Power & Renewables (formerly GTM Research) hosted a roundtable October 25th in New York City to discuss the current outlook for renewable project M&A. 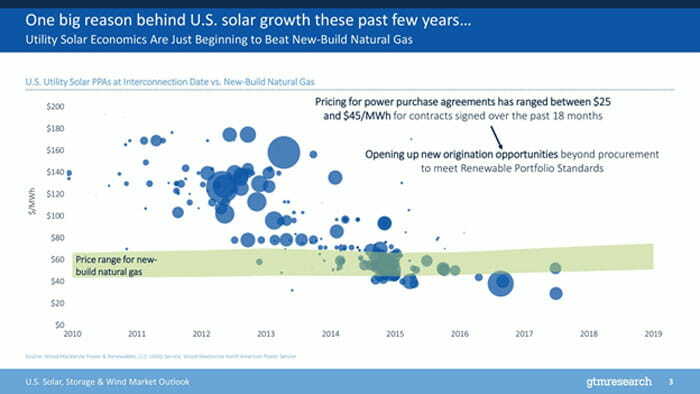 Colin Smith, a senior solar analyst with Wood Mackenzie, presented a market outlook and discussed how utility-scale solar economics are beginning to beat out new-build natural gas. Solar is just part of the story. 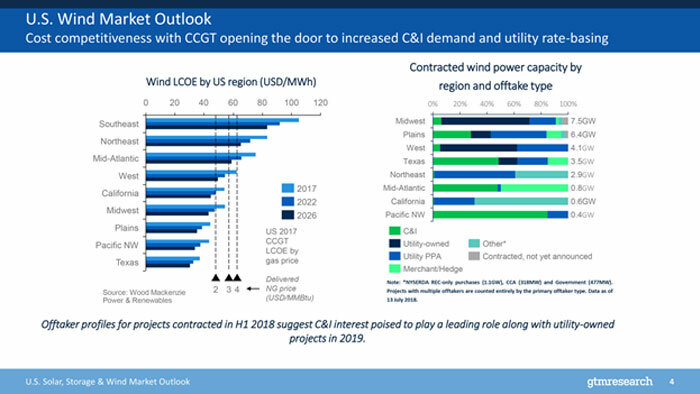 New market entrants, especially C&I off-takers, are also increasingly interested in wind, which is starting to rival combined cycle gas turbines in more regions of the U.S. The demand for wind is expected to peak in 2020 to capture the full value of the expiring production tax credit (PTC), which is a dominant theme in the industry and was during the panel discussion. “Anyone not paying attention to the [investment tax credit] or PTC must not be in renewables,” said Frank Palladino, managing director with CohnReznick Capital. As wind power development dips and then levels off in the 2020s, energy storage will skyrocket, as lithium-ion becomes cost competitive with peaking natural gas turbines. 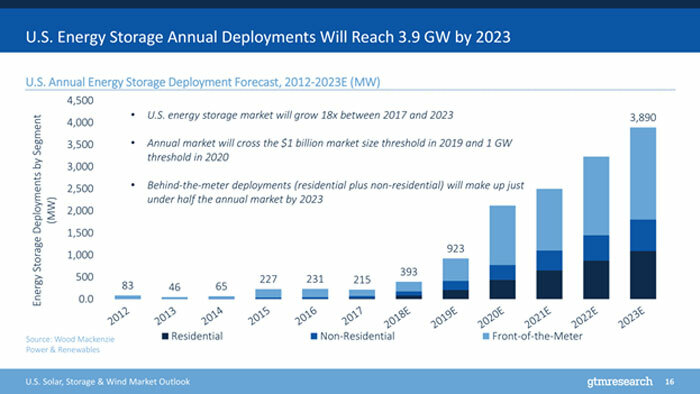 It’s not just energy storage that will emerge in the 2020s. Offshore wind has also become a reality, with multiple states prioritizing offshore wind development. “Being able to cite a project and get it right to the heart of Boston or New York? What other resource can you do that with?” Barrett Stambler, vice president of renewable origination at Avangrid, said of the promise off offshore wind. “Whether it’s solar, storage or wind, the entrance of more corporate off-takers has meant that more project developers are taking on more of the risk compared to a utility off-taker,” said David Zwillinger, managing director at D. E. Shaw. Additionally, more utilities are offering green tariffs to reach their Fortune 1000 customers. When it comes to renewable M&A, the story of corporate off-takers is truly just emerging, especially as the market moves beyond the PTC and ITC (investment tax credit) in years to come.